Drum Werks XXI: Reggae Drum Loops: Inspired by the traditional reggae grooves you know and love, these versatile live reggae drum loops reggae beats with a modern sensibility – perfect for building reggae drum tracks for traditional reggae or rock-reggae styles. Includes One drop, Rocker and Stepper rhythms variations. 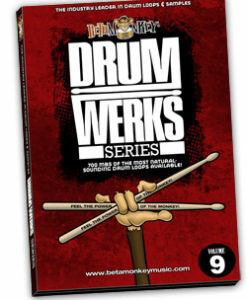 Inspired by classic and contemporary reggae drumming performances, Drum Werks XXI is an all-live collection of reggae drum loops. The goal of this sample pack was to capture the essence of the reggae drummers of the 70’s who set the standard for that elusive reggae feel and styles. Add this to more contemporary artists and groove derivations and you get a truly unique collection of live acoustic reggae drums. Grooves feature one drop beats as well as rocker variations, and are played with a straight or triplet swing feel. All that wonderfully elusive feel of reggae is captured for traditionalists but grooves also blend syncopated kick and snare patterns for a truly distinctive style that will work well in more rock influenced projects. These live reggae and reggae-rock rhythms will deliver a distinctive mix of the jazzy, funky style that influenced reggae rhythms. 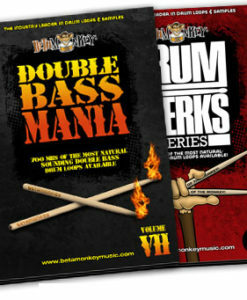 With a snare drum tuned very high and providing the necessary pop for backbeat and off-beat rhythmic accents, the grooves also incorporate cross-stick patterns and tom drums into beat variations. This sample collection of reggae includes One drop, Rocker and Stepper variations. Hi-hat patterns add additional flavor to the grooves, whether played in a straight or swung eighths or mixing in triplet cross-rhythms on the hi-hat. Whether you need the traditional one drop kick on three or the four beat flow of a stepper variation, your beats will deliver a hypnotic and constant drive of groove. Mix in a deliciously funky serving of fills and you’re ready to chop down some skank. In the more syncopated rhythms incorporating hi-hat and cross-sticking triplets on top of the “One Drop” rhythm typical of traditional reggae, users will find the grooves ideal for dub, dubstep, and hybrid dub music styles. These high-quality reggae drum loops are the perfect groove solution for reggae and rock-reggae drum tracks, delivering grooves to inspire artists after a pure reggae vibe as well as hybrid styles of rock-reggae. Versatile Blend of Reggae and Rock-Reggae Styles: Think classic reggae like Bob Marley, Peter Tosh and Burning Spear as well as the modern rock-reggae hybrid styles of The Police and 311. One drops, rockers, steppers – pure, reggae-inspired rhythms for a variety of musical settings. Fully-Sampled Drum and Cymbal Samples: A multi-velocity samples of a Yamaha Phoenix drum kit as well as matching Zildjian cymbals is included. Build new grooves in your sequencer of choice or augment the loops to create the right syncopation for your music. 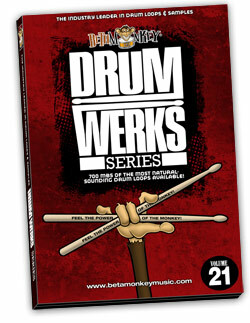 Superior Rhythmic Realism: No stiff metronome monotony found here – live, studio grooves show you what a live drummer can do – rolls, stick drags, dynamics not possible on anything but a real kit with a real player. 613 (1.07 GB 24-bit WAV; 736 MB 16-bit WAV) original, license-free drum loops and samples in 16-bit, 24-bit WAV, APPLE LOOPS formats. These are top-notch drum samples. Dynamics and EQ are solid and the array of choices for each style are outstanding. Clean, clear sound and a large selection of samples make this an excellent choice for my own work where I just want to get my music ideas out there without programming a drum machine. Highly recommended.